We study different aspects of the multiagent resource allocation problem when the objective is to find an allocation that maximizes Nash social welfare, the product of the utilities of the individual agents. The Nash solution is an important welfare criterion that combines efficiency and fairness considerations. We show that the problem of finding an optimal outcome is NP-hard for a number of different languages for representing agent preferences; we establish new results regarding convergence to Nash-optimal outcomes in a distributed negotiation framework; and we design and test algorithms similar to those applied in combinatorial auctions for computing such an outcome directly. Ramezani, S, & Endriss, U. (2010). 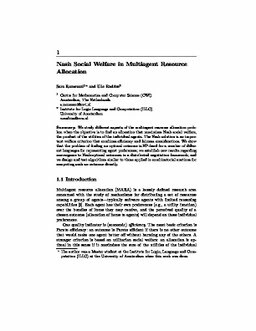 Nash Social Welfare in Multiagent Resource Allocation. In E David, E.H Gerding, D Sarne, & O Shehory (Eds. ), Agent-Mediated Electronic Commerce: Designing Trading Strategies and Mechanisms for Electronic Markets (pp. 117–131). Springer-Verlag.